In Gratitude for another year of red Ravine, with much appreciation to our readers and guests. You keep the community going strong and inspire me every day with your courage, grace, and humor. 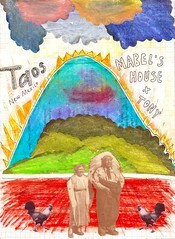 red Ravine was conceived in Taos, New Mexico, born on November 3rd, 2006, and launched as an Aries, April 7th, 2007. It seems important to mark the passing of time, to reflect and remember how far we have come. On the first anniversary in 2008, we were living dangerously. The second year, we celebrated poetry with a Postcard From Billy Collins — Kicking Off National Poetry Month. Year three explored the range of horoscopes of our readers. Here we are at the end of year four. I saw my first butterfly this afternoon signaling the birth of Spring. It held all the promise of a passionate year five. Thank you for all you have given! 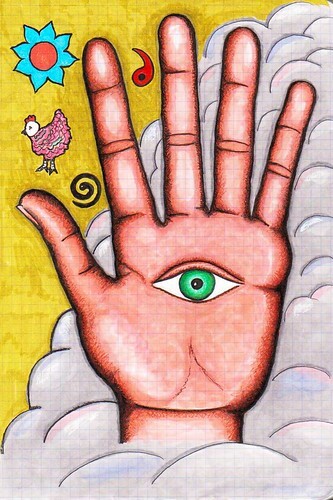 el ojo en la mano, icon of the eye in the hand (called “Hamsa” in Judaism) believed to ward off Evil Eye, doodle © 2010 by ybonesy. All rights reserved. It’s that time again. ybonesy and I are heading out for our annual 2 week blogcation. 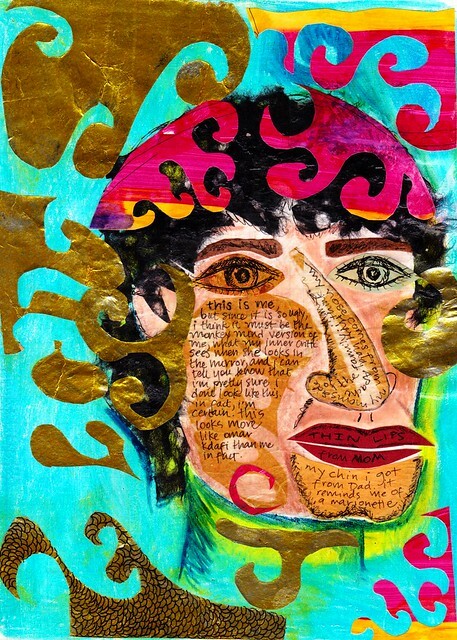 She’s got the Corrales Art Studio Tour coming up this weekend. 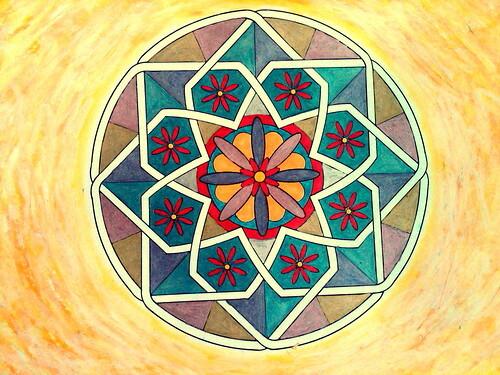 And I’m gearing up for Art-A-Whirl 2010 at the Casket Arts Building, May 14th-16th. So, for the next couple of weeks, we’re allowing ourselves to be free from the pressure of posting on the blog. red Ravine turned three a few weeks ago, and in blog years, that’s a long time. We find it’s good for us to take a break from the work of blogging, to relax, and enjoy the hiatus from electronics. We may check in once in a while. Or do a spontaneous post or two, but we’ll still technically be on vacation. 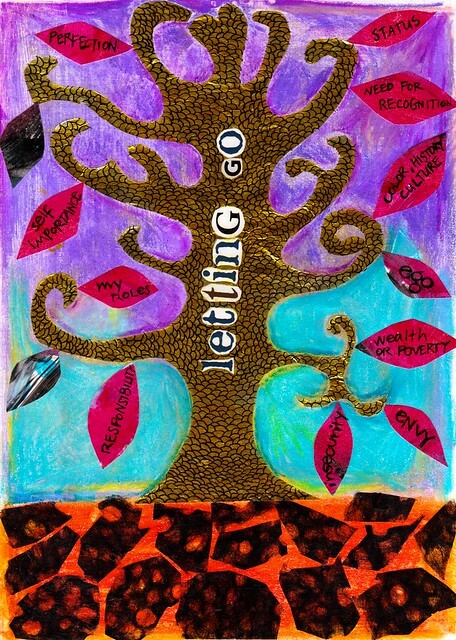 Taking time to refill the well gives us a chance to revisit our goals for red Ravine and fine tune our vision. We hope to come back fresh and revitalized. In the meantime, Writing Practice goes on. ybonesy and I write together weekly in an online group. And I just returned from a retreat with my Midwest Writing Group down by Lake Pepin, where I nearly filled an entire spiral notebook. I thought it would be fun to leave you with a few of the Writing Topics we wrote about last week in southern Minnesota (or you can choose from the Topics we’ve posted on red Ravine over the years). Thanks for reading and visiting red Ravine. Keep the pen moving, and we’ll see you in a few weeks. Ten minutes, Go! 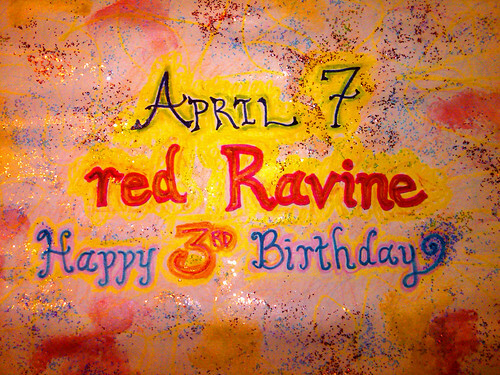 Happy 3rd Birthday, red Ravine!, Minneapolis, Minnesota, April 7th 2010, doodle © 2010 by Lizzie Bee. All rights reserved. QM, I looked up a make-shift chart for red Ravine. I went back to the April 7th post, and didn’t see a timestamp, so I used 9am, with San Francisco (WordPress) as the birthplace. That put the Moon in Sagittarius, Mars and Mercury in Pisces, and Venus in Taurus. But I’m betting that you and YB have more accurate data. You should swing by Cafe Astrology for a free natal chart, AND you can get free compatibility readings while you’re there, too. Then, let us all in on the results. In astronomy, the zodiac (Greek: ζῳδιακός) is the ring of constellations that lines the ecliptic, the apparent path of the Sun across the sky over the course of the year. The Moon and planets lie within the ecliptic, and are also part of the constellations of the zodiac. In astrology, the zodiac denotes those signs that divide the ecliptic into twelve equal zones of celestial longitude. When I was in high school, I belonged to a Tri-Hi-Y named The Zodiacs. My Sun is in Cancer, with Taurus Moon and Taurus rising. My ruling planet is the Moon. ybonesy and I haven’t done compatibility readings, but after 3 1/2 years of publishing red Ravine, I’d say our Gemini/Cancer combination seems to be working. I thought it might be fun to take this opportunity to poll our readers (as ybonesy mentioned in the comment thread on the 2008 post) and see what signs they are. ybonesy thinks we have a high percentage of Gemini readers on red Ravine. But I’m not so sure. What sign are you? In Gratitude: Here’s to another year of red Ravine. With much appreciation to our readers and guests. You keep the community energy flowing, and help us keep going. Special thanks to ybonesy, my blog partner, an inspiration. 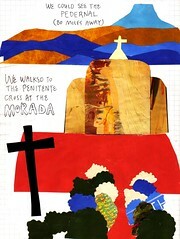 And to Liz, my partner in life (who also created the doodle in this piece). I could never have kept going on this project without the two of you. Can I be frank? I’m not fond of rules. 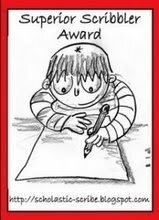 And I absolutely cherish receiving blogging awards, but I struggle with the requirement that we link back to the person who thought up the award to begin with (who, in this case, we don’t even know) and then dole out exactly five awards to other bloggers. So, I am going to rejoice in the fact that QuoinMonkey and I recently received The Superior Scribbler award from Sharon Lippincott (aka ritergal) over at The Heart and Craft of Life Writing—who, by the way, we’ve been following for over two years and who we enjoy immensely—but I’m not going to re-post the rules of the award nor do the linky-link thing nor bestow the award (I hate bestowing anything, unless it is a wart) to five bloggy friends. First, Sharon-slash-ritergal is a Superior Scribbler. She wrote and published the story of her early life in New Mexico (you gotta love that!) and gave a blow-by-blow of how she did the publishing part. And at the end of almost every post, she includes a “Write Now” prompt, motivating readers to not just read her stuff but write their own. Bo over at Seeded Earth has inspired us for a couple of years with her photographs, not to mention I got to meet her and Mr. Bo in person (and they are lovely people), but Bo recently redesigned her website, and man, she is rockin’. Role model, friend, fellow lover of nature, all-around wise soul. Another photographer, Stevo at Asian Ramblings, wows us with the way he documents his life living as an expat in China, plus he’s a friend on Facebook, which means I get to hear what’s really going on in his head. Kidding. If you’ve never visited Jules over at Thinking About…, you have missed some great book and film reviews and a most excellent chicken parmigiana recipe, which, by the way Jules, I made last week and had my family believing that I had been returned from an alien abduction with superior cooking skills. I have since shattered their dream. Corina at Wasted Days and Wasted Nights is another person you must visit if you haven’t already. Her posts are often based on memoir, and what memories she has, not to mention she’s about to become a grandmother. And given that I grew up on Freddy Fender, I was hooked the moment I saw her blog title. You’ll notice we’re drawn to photographers, which leads us to Robin at Life in the Bogs. Excellent photographer and finder of the perfect quote to go with the photograph (although that’s her other blog–Bountiful Healing) and on Bogs we get to share in Robin’s life and her love of nature, especially her ever-changing pond. Heather, Heather, Heather. What can we say about Heather, except, my God, that is one freakin’ funny woman. And she is entering her hour, which is to say, she is the Queen of Hallo-Ween. So if you keep an eye on Anuvue Studio during the month of October, chances are you will see the transformation of her home into a full-blown folks-otta-be-paying-for-this-but-Heather-would-never-make-’em event. Oh, another stellar photographer to boot. So these are the folks we’d like to shine a light on—today. Visit them, comment, relish, noogie, Snoopy dance, high-five. You won’t be sorry. Oh, and we will do this again, hopefully not before too long, since there are others we’d like to point out and since ya shouldn’t need an award before it dawns on you that the blogging community you’ve been hanging with for a year, two years, some going on three years now—they’re awfully talented and pretty darned special. We’re back after a 2+ week blogcation. How time flies. On Sunday ybonesy sent me an email titled: Getting Back in the Saddle. We both agreed that the vacation from blogging was refreshing; we needed it. We also took a hiatus from electronics, with the exception of learning a bit about Twitter. It’s a whole other world that moves at lightning speed and (like blogging) has its own protocols, courtesies, and idiosyncrasies. But there are some good, smart people on Twitter including a whole slew of writers and artists. We’ll keep using Twitter for updates, to stay in touch from the field, and to add links we find of interest or that relate to red Ravine. So keep watching our sidebar for the latest Tweets. If you see an RT, it means we picked the link up from another Twitter user and are giving them credit. Oh, and the bit.ly and tiny.url link shorteners we use are perfectly safe. We test them first and wouldn’t steer you in the wrong direction. But what should I post today? 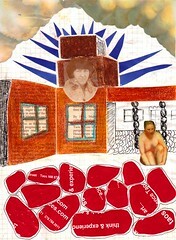 ybonesy’s back from Vietnam and has a few posts in the works; I survived Art-A-Whirl and am excited to be in the studio. I’m leaning toward something simple for our first day back. While on vacation, I didn’t do much writing, but I did go hear Patricia Hampl at the Highland Park Library in St. Paul. I had already finished The Florist’s Daughter and made the commitment to read all of her work; she is my kind of writer. Her talk in St. Paul did not disappoint. She was there to promote the new book, Home Ground – Language for an American Landscape from Trinity University Press. The book is edited by Barry Lopez and Debra Gwartney and contains an A to Z history of words about the land written by famous writers like Terry Tempest Williams, Barbara Kingsolver, Robert Hass, and Franklin Burroughs. Lopez gave each writer a list of words for which they wrote a definition using a combination of research and wordsmithing; the result is over 850 terms—from `a`a to zigzag rocks—defined by 45 American writers. It’s beautifully written with pen and ink illustrations by Molly O’Halloran. Hampl explained that Barry Lopez had asked her over a glass of wine if she would be interested in participating in the project; she agreed. And after being initially uncertain about the words she received, she ended up loving the project. In addition, each writer was asked to choose the place they considered to be their “home ground.” Patricia Hampl chose the North Shore of Lake Superior, womb of the earth, a Minnesota landscape completely different from the urban setting of her home in St. Paul. 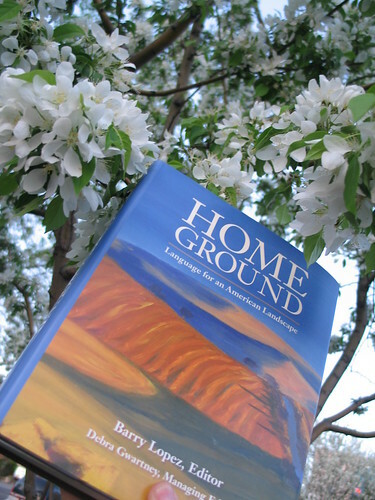 Home Ground – Language for an American Landscape is a historical map drawn by writers — word geography with cairns that weave through centuries of the American landscape. Liz and I fell in love with the book; she purchased it that evening. When I took the photograph at the top (that’s Liz’s finger holding the book up), Patricia Hampl had just walked out of the library and we chatted for a few seconds about the bloom of Spring on the Minnesota landscape and how well the book sold that night. I’m certain it will find a prominent place on our reference bookshelf.